Because I’ve been dreaming of the street tacos I had while in Mexico, I decided to put that bag of masa I’ve had in my cupboard since the last time we attempted making our own tortillas to good use. It’s been a while because let’s face it — San Diego is a hop-skip-and-a-jump from the border and there are plenty of places to get authentic tacos here. I just never order them. I’m more of a carnitas person so can’t tell you much about how good the tacos are at our favorite “Los Dos” across from Albertson’s on Turquoise in Pacific Beach. It’s on my agenda to find out, though. 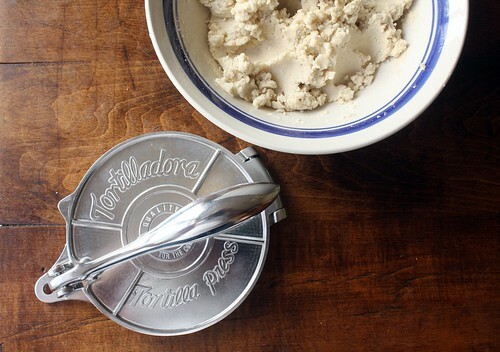 In the meantime, I treated myself to a tortilla press to the tune of $17. 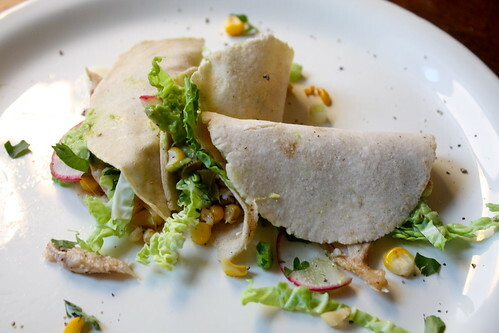 It makes me smile about this cooking “hobby” I have, because that sum could purchase quite a few packages of perfectly fresh corn tortillas if you know when the delivery guys stock the best ones at the market. But the woman in Puerto Vallarta made it look so easy: Make a ball, put it on the lower plastic covered plate, press, and peel. Voila! Yes, well, let’s just say that after watching me try a few with less than completely desirable results, my husband was gnashing at the bit to step in and finish the rest with no trouble at all. Go figure. Perhaps it’s a math thing. And the taste? 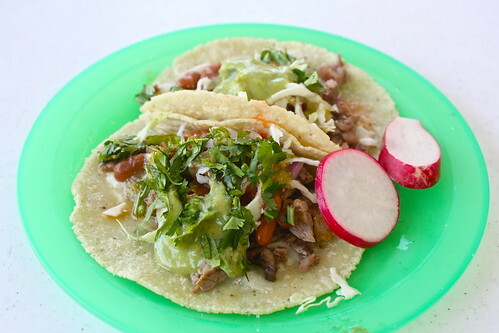 Would they compare favorably with the El Cisne taco cart in Puerto Vallarta? I say definitely. 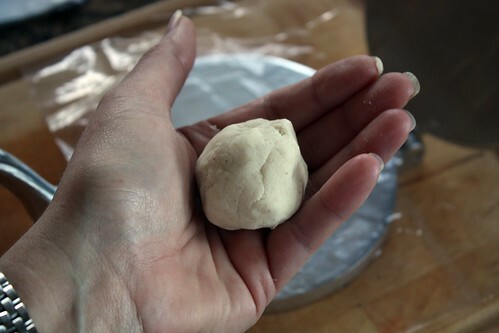 In a medium bowl, mix all the ingredients until a soft dough begins to clump and you can make a ball that is smooth. 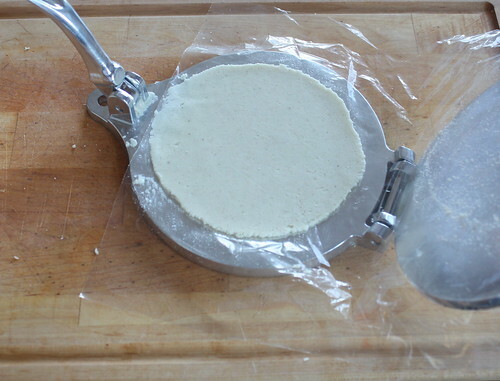 Cover with plastic wrap and let sit for at least 30 minutes at room temperature. While the dough is resting, prepare the filling ingredients. To prepare the tortillas, make a ball a bit smaller than a golf ball. 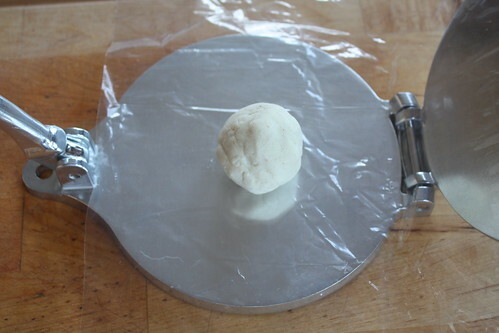 Place between sheets of plastic wrap on the press and mash. Peel from the plastic and place on a medium hot griddle or cast iron skillet about one minute per side. They don’t need to brown. Remove to serve as you make them, or stack on a warm plate and keep covered. Makes 18-20 tortillas. Mix and match the fillings to your preference. Bare bones is meat, a sprinkle of beans (which I forgot!) and cabbage. Masa de harina is corn flower or powdered corn meal. La Pina is a popular brand sold in the baking section of your market, but it’s also available in bulk in specialty stores. I used left over chicken we ate the night before. To do your own, roast a young chicken at 350 degrees F for 1 hour. Fill the cavity with quartered lemons, whole cloves of garlic, and sprigs of thyme. Rub the exterior with olive oil and sprinkle with a Southwest or Mexican spice blend of your choice. Mine has salt, garlic, chili powder, and cumin in it. Cabbage? Absolutely. It’s crunchy and flavorful — much more flavorful than iceberg lettuce which you’d never see in one of these tacos. The salsa verde we like is made by Embasa and comes in small cans. It’s a tomatillo based salsa. You can make your own as I have often in the past — and it doesn’t take more than 20 minutes — but this is supposed to be easy, right? I squeeze 1/2 lemon over the radishes and cucumbers and sprinkle on some salt. The extra flavor is nice. If you don’t want to put this in the tacos, then it’s a garnish that’s great for cooling down the heat if you use spicy salsa. “Guacamole” isn’t what I was going for here. In fact, the sauce used at El Cisne was much more thin, most likely mixed with Mexican table cream. It’s pourable. But I love a nice avocado with a squirt of lemon eaten right out of the shell, so why mess with it? 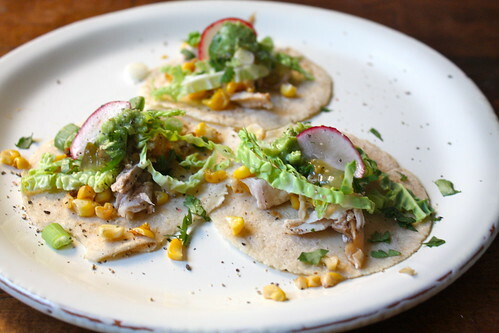 The corn isn’t something I’ve seen on tacos, but we’re addicted to it right now. 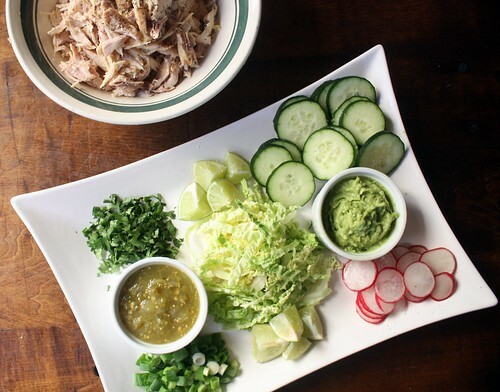 It’s perfect for a meal like this whether you put it in the tacos, or eat it as a side. The flavor is amazing. Scrape it off a fresh cob into a clean medium hot cast iron skillet. Allow it to caramelize a bit by letting it sit. It will stick, but not much. Salt and a squirt of fresh lime juice if you want makes it perfect. 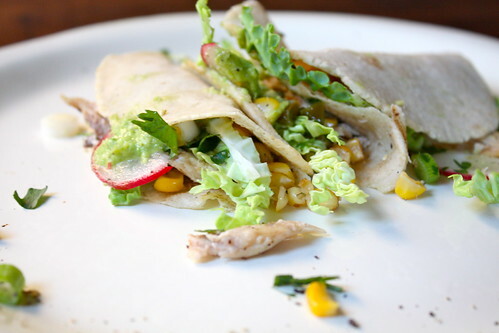 Tacos remind me of home just like so many of the other recipes I’ve written about from my childhood. It was one of those “treat” meals we didn’t have as often as others but always looked forward to. We’ve always fried our store-bought tortillas in oil first, but not until crispy. No, ours were soft and filled with ground beef, shredded cheddar, chopped tomatoes, and yes, iceberg lettuce. To this day, that’s pretty much how we make them, although my husband tried to get me to use a taco seasoning mix in the beef for years and finally gave up. I’ve added avocado, vary the cheese from time to time, have to include cilantro and salsa now. Finding out my mother was making tacos for dinner was even better than looking forward to pizza. Maybe it was the informality of spooning whatever we wanted into the tortillas, or trying to see who could eat the most. We were all skinny waifs with seemingly bottomless pits for stomachs, so my brother and I could eat six. I wince thinking of it. I’ve probably left you little or no time, but I’m passing this tag on to Judy of No Fear Entertaining, Haley of Appoggiatura, and Ben of What’s Cooking? What droolworthy recipes remind you of home? Thanks to Kristin of Dine & Dish, I have recently matched with a new blogger, Maia of Dessert-o-licious in the Adopt a Blogger event. And just for the sake of comparison, don’t my tacos look just as yummy as theirs? Well? Okay, so my plate’s a bit messy, but still. And sure, theirs are carne asada. I’ll work on it, okay?